I found this, courtesy of Mike the Mad Biologist. It’s around three centimetres (or one attoparsec) in diameter, perfectly spherical, leaves trails in the mud and was discovered off the coast of the Bahamas. Believe it or not, this is a single celled organism. Gromia sphaerica is a gigantic relative of the amoeba. It’s been discovered before, but this is the first time it’s been seen actually moving — rolling along and leaving trails behind it in the mud. Trails which apparently are making some palaeontologists question conclusions they came to over similar trails seen in precambrian fossils. One could speculate that perhaps life experimented with how large single cells could grow before ‘going multicellular’. Perhaps we might eventually find similar things rolling around on the surface of Mars. They’re certainly decidedly alien compared to the more familiar forms of life we know about. You have to wonder if perhaps life elsewhere might find some kind of optimum cell size. Perhaps life on giant planets (as Sagan envisaged in Jupiter’s clouds) might evolve to encompass cells even larger. 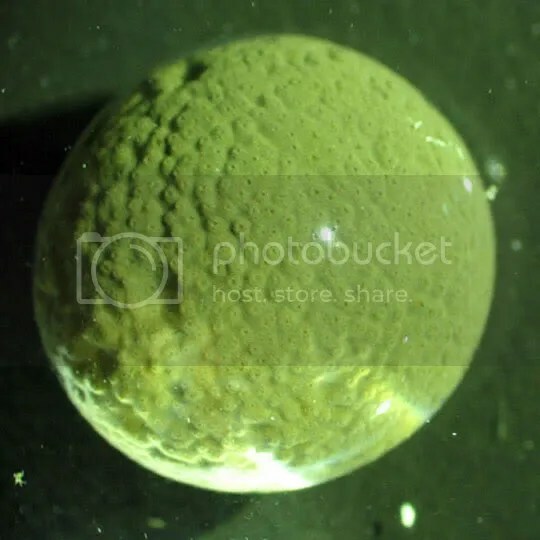 Imagine a multicellular life form composed of cells this size! EDIT– I found a little slideshow about these things, courtesy of Crowlspace. This entry was posted in astrobiology, Imported from Livejournal and tagged biology. Bookmark the permalink.